Have you ever seen almost 4,000 Santas all in one place? This Saturday December 10th, Santas of all shapes, sizes and ages will be running amok in the downtown when they participate in Canada’s largest 5k Santa Run. All race entrants receive a Santa suit which they wear for the duration of the race. This event is organized by VR Pro and some of the proceeds are donated to St. John’s Ambulance here in Burlington. This event is so fun and quirky it has been featured on the Canadian Runner Magazine website. Gotta love that! When you see all these red and white Santas laughing and jogging along the waterfront route, it really gets you in the holiday spirit. If running is not for you, be a cheerleader by lining the race route and encouraging the racers, it is really something to see! The race begins at 9 a.m. at Pearl and James St. and the runners head east along scenic Lakeshore Rd., north on Maple Ave., and then cut back through quiet residential streets towards downtown where the race ends on Lakeshore just east of Pearl St. Check out this video of the 2010 race. While you are downtown you can also get in a little holiday shopping at the unique boutiques and then enjoy some lunch at one of the fabulous bistros, cafes or restaurants. Don’t forget to stop in and see us at the visitor information centre and pick up information on things to see and do in Burlington over the holidays or get some great stocking stuffers such as books, t-shirts and other city souvenirs. If you say you read this blog we will even give you a gift! You can also enter into a draw brought to you by Burlington Downtown to win 1 of 2 – $500 shopping sprees during the month of December from downtown merchants. Now that helps with your nice and naughty list! The downtown is a magical place to visit in December especially after dark with everything decorated for the holidays. 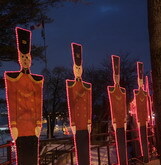 Downtown merchants have enthusiastically decorated their storefront windows with various holiday themes, the lampposts and trees are alight on the major routes and best of all Spencer Smith Park is ablaze with the Lakeside Festival of Lights. Include visiting the lights as part of your family’s annual traditions. The holidays would not be the same without a drive past the Burlington Teen Tour Band red coats that line Lakeshore Rd. or a walk through the park on a crisp winter evening surrounded by the many glowing lights from numerous displays. There is no entrance fee to the Festival of Lights, it is a gift to the community thanks to the efforts of volunteers and the support of many generous sponsors that make the festival possible every year. The Festival is in its 16th year and glowing and runs nightly until January 12th, 2012. We suggest that you park in the parking garage, it is free after 6 p.m. and then walk along Lakeshore to Brant St. and down the stairs or roadway into the park. If the cold weather continues you can bring your skates and test out the rink at the Rotary Centennial Pond at the west end of the park. As I am writing this I clicked on the waterfront web cam and the mini zamboni is clearing the ice, so it is looking good! Check out the website before you go to make sure the rink is open. The Tourism elves decorated our window in the theme Holiday at Home this year and we featured various local attractions that you should check out during the holidays, including the RBG, Art Centre, Museums, Performing Art Centre, Conservation Halton parks, Bronte Creek etc. Although we never seem to win the window competition, we have fun decking the halls and hope that our partners see some increased visitation from this promotion. Hope you Holiday at Home this year, bring friends and family to events, attractions and to dine and shop and enjoy everything Burlington has to offer.